I made this little mod to give Sodium from Mekanism a purpose. Previously, I had a ModTweaker script, but now this project has grown too large to be just a script. This mod needs CsokiCraftUtil, Mekanism and Thermal Expansion to function. In 1.7.10, see NEI for crafting recipes. Fireman's suit: an armorset with Fire protection V on it. It is made by adding Fireproof PE sheets to iron armor. Fireproof PE sheets are made by adding Aluminium hydroxide (fire retardant) to HDPE plastic. The mod is incompatible with the latest version of Mekanism. Could you please update for 1.11.2? are there any plans to release a 1.12.1 version? Looks like the newest ThermalExpansion (and related) updates broke this integration. Please try patch 1 (without Redstone Arsenal) and inform me whether it is fixed now! I'm so sorry for the inconvenience! NovaSol I can't see your comment in here, but it shows me the notification, weird :P Anyways, to answer your question: There IS sodium carbonate in the mod :P you make it by adding carbon to sodium hydroxyde. 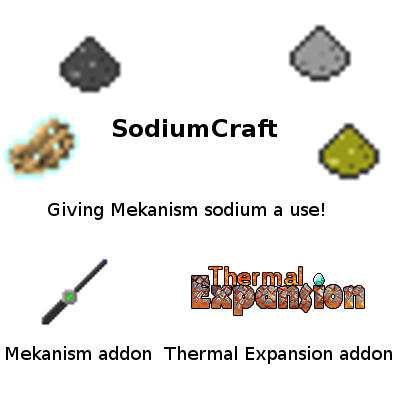 Also, if you have ThermalExpansion (you should, this mod was designed to use it; the vanilla recipes only exist as a plan B) you can craft the potato battery with sodium hydroxyde and copper, instead of lead and redstone. But I'll look into NaCO3 batteries, that could be interesting. What uses does this give to sodium? Recipes are shown in NEI. Basically, you can crystallise it into Sodium Dust, which can then be processed and used in all sorts of useful recipes, for example 1 wheat->2 bread, 1 sand->2 glass, mobheads->16 rotten flesh and so on. Also, it detects whether you have a mod that adds Aluminium and it can give you 3 ingots per ore.